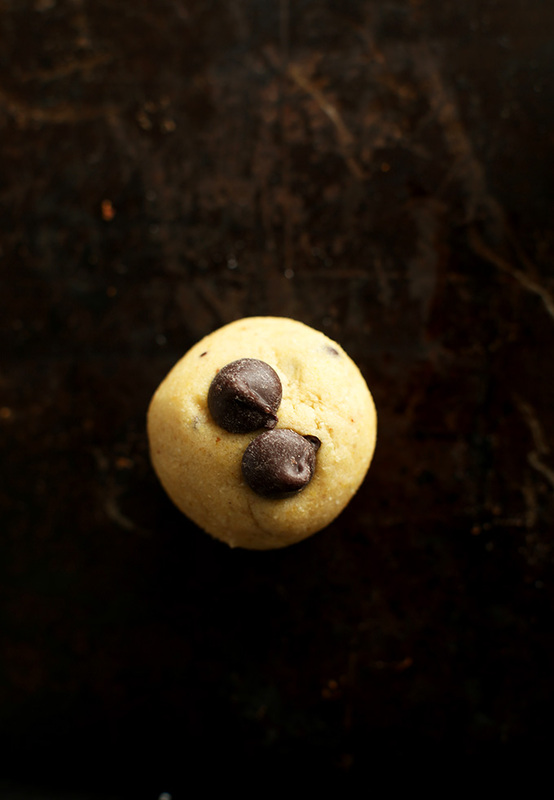 I am currently in love with two things: 1) our new Canon 5D Mark III and the way a 50mm lens + an extension tube totally kills food photography, and 2) THESE FRIGGIN’ COOKIES. Speaking of these friggin’ cookies, they’re gluten-free thanks to this (amazing, versatile, whole grain) baking mix. (Yes, the one I made pancakes with.) And they are SO delicious and soft and addictive that you’d NEVER guess in a million years they were gluten-free. Hooray! When I had such great success with the gluten-free mix for pancakes, I immediately wondered if it would work in cookies. Well, it turns out IT DOES – really, really well. 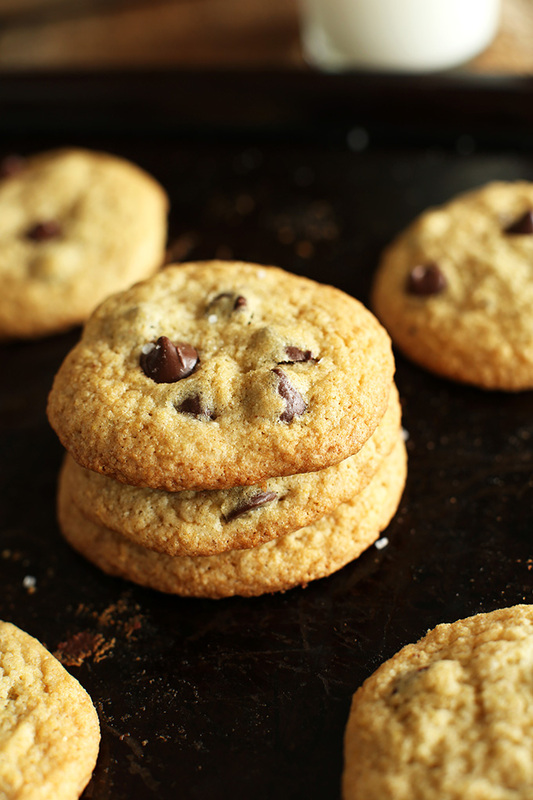 Including the mix these cookies require just 7 ingredients and 1 bowl. That’s simple baking at its finest. So what do these guys taste like? & Kind of (totally) perfect. B) How they reminded me of the Keebler Soft Batch cookies I used to murder when I was a kid. Seriously, they’re THAT DELICIOUS. You have to make these cookies! Cheers. 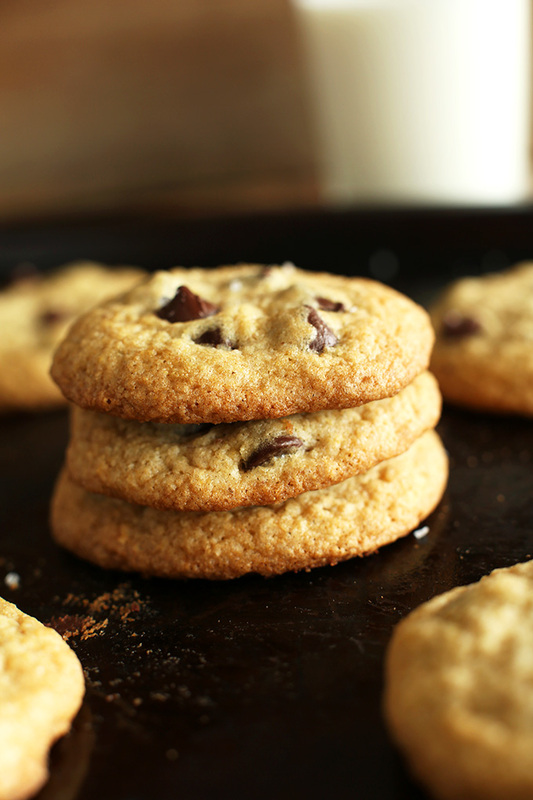 7-ingredient gluten-free chocolate chip cookies! Tender, chocolaty, and undetectably gluten-free. Using a mixer, cream butter and sugars in a large mixing bowl. Add egg and vanilla and beat again until well combined, scraping sides of bowl as needed. Add gluten free baking mix in two batches and mix again. It won't be so thick that you can't continue mixing it, but it should appear "doughy." Stir in chocolate chips, cover and refrigerate overnight or for at least 4-6 hours until thoroughly chilled. You should be able to roll the dough into balls before baking. Once chilled, scoop out rounded Tablespoon amounts of dough, roll them into balls and place them 2 inches apart on a baking sheet. *I have not tried this recipe with any other gluten-free flours or mixes, so be sure to use the mix I list! I made this for and with my 5-year old grandson with some adaptations. He has severe food allergies, so eats gluten-free, dairy-free, and egg-free only. I used vegan butter as was optional in the recipe, and substituted applesauce for the egg. I also used the ‘Enjoy Life’ chocolate chips so he could enjoy them without concern about milk by-products sneaking in. He absolutely loved the dough; licking the utensils and bowl as we waited for the dough to chill in the fridge. He also had a great time spooning it out when it was ready. The cookies themselves were a huge hit, and he was proud to share them with our family. A recipe he can eat that we all can enjoy – perfect! I made the cookies, and they were as advertised, irresistibly delicious and without at all giving away their gluten-free status–as my favorite t-shirt says, “Gluten is the new al Qaeda.” I made them, not because I don’t tolerate gluten, but for my daughter. Then I made the pancakes for some small friends with Celiac disease, and not only were they a hit with them, but with me the Pancake Snob as well. Since then I’ve been using the flour in a variety of baking adventures, and it has become my favorite medium of ovenly expression. Thanks to you, and to Martha Stewart! Great! Thanks for sharing your experience, Jo! These were melt in your mouth delicious! I used dairy butter, mini chocolate chips and I was on the last of my gluten free flour so I subbed in 2 tbsps of white flour. Omg… soo good! Glad I only made a few at a time cause these were devoured! Yay! Glad to hear it, Mandy! Hi, i would love to make this recipe. Will bobs red mill 1 to 1 baking flour work just the same? Also what is the purpose of refrigerating the mixture prior to baking? We haven’t tried it with bob’s mix, but it might work! If you give it a try, we would love to hear how it goes! As for refrigerating, it helps firm up the vegan butter since it can cause the cookies to spread too much if not chilled. Ummm I think the cook time and prep time should be adjusted to incorporate the 4-6 hour to overnight chill time! It’s certainly misleading to see a 40 minute total time at the top of the recipe and then get hit with the reality of it all. I know when going through recipes this would be extremely helpful from the get go. Since you’re providing that type of information please make it accurate. Thank you! Thanks for the suggestion, Lindsey! I’ll be sure to pass it along. Just made these. I belated realised I had used Coarse Ground Corn instead of finely ground, but people still seem to love them, so that’s lucky, because I double it! Also when I finished the mix (having doubled it), the mixture was still very wet and I ended up putting two additional heaped spoons of the flour mixture in, which helped a bit. It was still slightly wet, but after chilling for 4-5 hours, they were workable. So I don’t know if doubling through off my batter because I was very careful in measuring everything out. Still delicious though and a perfect g.f. version of Martha Stewart’s! I made these yesterday, they are delicious! But for me the recipe only made 6 cookies, maybe my tablespoons are a little bigger.. or did I use a servingspoon? Made 6 cookies baked for 20 minutes! Delish. Hmm it sounds like you may have used a serving spoon, Ellen! Glad you enjoyed them though! Best GF cookies I’ve ever made! Used King Arthur baking mix. Thanks so much for the recipe! Used bisquick gluten free mix, only used white sugar bc I was out of brown and didn’t wait to refrigerate the dough. Turned out just like Tate’s bake shop cookies!! Flat, crispy and yummy. Can’t wait to see what happens when I actually follow the recipe! I’ve made these once before and loved them and want to make them again. I just wanted to confirm the sugar content- there’s 1/4 cup coming from the pancake mix, and an additional 1/4 cup in the cookie recipe? Plus the 1/2 cup brown sugar? I’ve made over 500 of these cookies for students in an after school program but now I would like to make them vegan any suggestions. And fyi they were amazing the kids staff and parents who were not into anything healthy loved them . I just made the dough and am now reading the comments. Where is the salt and the baking powder on the ingredient list? Where can I find the gluten-free baking mix? Is there a brand name? I made this recipe and for my first try of gluten free cookies, it’s pretty good! Going off flour will be easier having chocolate chip cookies! I baked the cookies for 10 minutes and it was too wet in the middle. I popped back in for 2 minutes and they are delicious! I just made these with Arrowroot Gluten Free flour (which contains Xantham Gum) and 1/4 teaspoon of baking powder and they turned out well! I suggest that you update the recipe to clearly state in the ingredients that if you’re not using the baking mix you linked, you will need to use baking powder. I saw a number of commenters miss that step and who were disappointed by flat cookies. I am sure the flour mix you linked to is great, but if you’re like me and searching for a cookie recipe you want to make that day, it doesn’t work to have to order something. Anyways, thanks for the recipe! but it took me “pancake mix” page. I searched your website for the “GF flour blend”, I found it and followed the ratios. OK, then I went back to cookie recipe, and I did not know how much baking powder and baking soda to use… I used the amount on “pancake mix” page as a possible reference. So, what is the correct answer? which is the correct flour and amount of b. soda and b. powder? ps. the dow is chilling till tomorrow morning when I bake it into cookies. Hi Dina! Sorry the title is confusing. Use the pancake mix as the gluten-free baking mix! YUM!! I have celiac and have a hard time finding reliable (and yummy) gf cookies! Thank you! Delicious, although my cookies didn’t rise. The dough balls just melted into each other, and baked into one giant flat cookie, which I had to cut into individual pieces. They’re very crumbly. I found another similar gluten free recipe that used extra baking soda, which I added to the rest of the mix, but still no luck. I didn’t have time to chill the dough overnight, so I popped it in the freezer for about 15 minutes or so, until the dough was stiff. I thought that would do it, since that batch did start to rise a bit as it cooked, but then they all melted into each other again. I used Bob’s Red Mill GF pancake mix (which has baking powder and baking soda in it). Any advice? I would make them again, but I’d like to be able to get my cookies to rise and stay together once baked. Is it all just in the chilling of the dough? Or is there a certain brand of GF mix that works better than the others? Thanks! Oh, I forgot to mention that I am vegan, so I used ground flax with water instead of the egg. Could that have something to do with the cookies not rising or staying together? I never had an issue with the flax substitute before, but I also never baked GF cookies before. I loved these! I made them vegan by using 1 Tbsp flax + 2.5 Tbsp water, and I used Bob’s Red Mill 1-1 baking flour replacement, and then added the baking soda, baking powder, and salt. Since I hadn’t realized I needed to refrigerate them overnight, and I was making them at 8pm, I just put them in the fridge for an hour and then the freezer for another hour. When I went to roll them out, though, they thawed a bit too much so I put them back in the fridge for about 20 minutes. And it was all worth it, because they came out SO fluffy and soft and moist! And not crumbly at all. My partner and I loved them! The only things I would change are: excluding the salt all together (they were definitely too salty, and I only used 1/2 tsp instead of the full 1 tsp), and patting down the cookies. I really like soft, big, flat-ish saucer-like cookies and because I just put them in the oven as little balls, they got tall and fluffy. Which is fine! Just not my preferred shape and size. Thank you for making this recipe! This was my first gluten-free baking adventure and it came out amazingly. Thank you thank you!! I made these with standard gf flour from the supermarket and they were great! Kids LOVED them! These look delicious!! Can you use any GF pancake mix for these? Thanks! I’ve tried soooo many recipes for GF chocolate chip cookies and this one made it to my recipe book! Hands down the best gf cookie I’ve ever made. They don’t even taste gluten free at all! Both my husband and son are allergic to gluten so these were a huge hit and will definitely be made again. I want to say thank you so much for this recipe! I’m coeliac, and have been gluten free for a year and a half so far and I really miss proper tasting cakes, pastries, cookies etc!! So I tried these yesterday and I couldn’t get white rice flour or cornmeal so I just substituted them for cornflour and plain white gf flour and they worked out perfectly! They really don’t taste gluten free and my non gf family agreed. Will definitely be trying some of your other gf recipes soon! these were delicious! i added walnuts and about 5 more minutes of baking time and they came out amazing. great recipe. Hi Dana! I am totally new to GF baking – my son was recently diagnosed. When checking out your chocolate chip cookie recipe, I clicked on the link for your gluten free baking mix recipe and it directed me to your gluten free pancake mix recipe. Are they the same? Thank you so much! Can’t wait to try it! Hi! I love the simplicity…but….you don’t call for any baking powder or baking soda in the cookie recipe, or in your flour mix. But, surely you used them. Just wondering how much. Thanks! I made these exactly as the recipe stated with one substitution…Aquafaba in place of an egg. They came out very flat, not soft and chewy. Do you think I would have been better off with a flax egg? Hi Kelly! That’s so odd! Did you remember to add the baking soda/powder? That’s the only thing I can think of. They aren’t a super fluffy cookie but shouldn’t be super flat either. Hope that helps! Thanks for responding! I added the baking soda and powder to the gf pancake mix. I didn’t see to add any more to the cookie recipe. Maybe all the ingredients for the pancake mix didn’t get mixed good enough, I added all to a ziplock bag and shook it up. Let me know if I needed to add more baking soda and baking powder to the cookie recipe. Big fan of your recipes, thanks so much :). Is there a substitute for the eggs? You could try 3 Tbsp aquafaba (chickpea brine) per egg! Not bad. I made these using almond flour. I also cooked them on parchment paper. The first 2 trays went flat. I added a little more almond flour and the next trays were better. I think if I add about 1/4 C or so more of the almond flour they would work. I used the Bob’s Red Mill 1:1 Baking Flour and they turned out perfect! Nice and fluffy. I did refrigerate them for 1 hour prior to baking. I also had to add about 6 more minutes to the suggested baking time to get the toasted edges. I would highly recommend this recipe for a gluten free treat! Yum!!!! Thank u!! Very Keebler like!! Great cookies! Made as printed, yet used King Arthur GF baking mix, & they are perfect. I made these cookies and they turned out EXCELLENT. I followed the recipe exactly, with the exception of the flour mix. I think a huge part of baking comes down the the quality and kind of flower used. I always use Robin Hood Gluten Free all purpose flour new formula with xanthan gum. I love not having to blend the flour myself, and it includes rice flour, potato starch, pea fibre, tapioca starch, and xanthan gum. It is ideal for baking cakes, cookies, and pies. Making this recipe, I made sure to use exact measurements by filling my measuring device and using a butter knife to scrape along the top making a flat plane to ensure it is the correct amount, no more no less. I also used an electric handheld mixer to beat the ingredients together, ensuring that the sugar, butter, and egg were properly blended into a smooth concoction. The batter is too sticky after mixing, so refridgerating is necessary. I used a metal mixing bowl which helps keep the batter cool after removing from the fridge. I only refrigerated the batter for 4 hours, but was very quick in the process to transfer the batter to the cooking tray to prevent the batter from warming up. I used a 1 tablespoon measuring spoon to scoop each cookie onto the tray. This helped me create equal sized cookies, and also easily rounded the batter into balls so I didn’t have to roll the batter much by hand. For baking I actually just put PARCHMENT paper overtop broiling rack instead of using a greased cookie tray. My cookies turned out beautifully! They were not flat at all. (I think making the batter into the round balls is extremely important as the cookies quickly flatten while baking.) My very picky gluten eating boyfriend loved these cookies, saying they were the best I’ve made so far!! He actually tried to steal a few before they were done cooling! I’m so happy with the results of this recipe. This is my easy go-to cookie recipe now. Thank you so much!! Hi!!!! It doesn’t say in the instructions but I am using bobs 2 in 1 and I added baking soda but do I also need baking powder for the recipe? Although these look seriously delicious, they are not vegan if they include egg :(. Milk-free, yes (or dairy-free if eggs don’t count?). One day I will try these though! Thank you. Just tried these; I believe I followed recipe to the T. I left the batter in overnight and baked them in the morning. They smelled great and the texture was perfect. They taste great with the exceptions of a mild “floury” taste. Any suggestions on what might have gone wrong? I just made raisin pecan cookies using the g f waffle mix. I used applesauce for the fat and flax seed for the egg. Added oatmeal cinnamon and raisins and pecans. They are fantastic. Is there a way to add a photo? 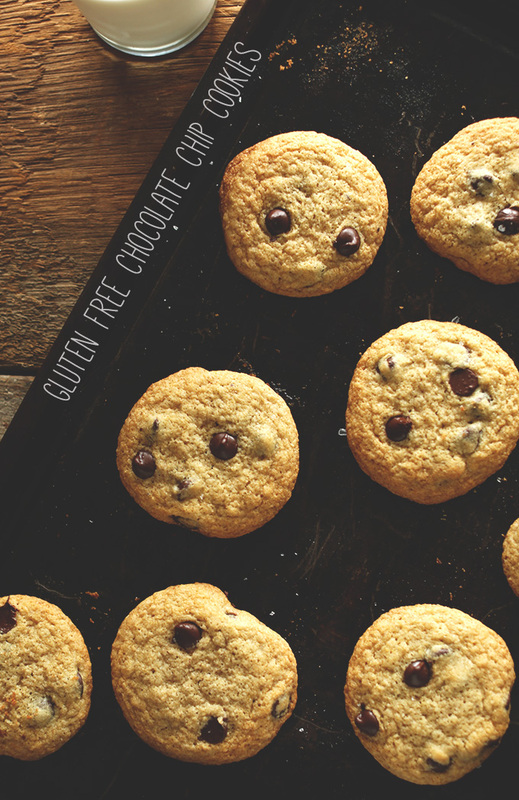 LOVED these gluten free chocolate chip cookies! I used Bob’s Red Mill Gluten Free Biscuit and Baking Mix and had to increase the oven time to 14 minutes at 350F for my oven (for my frozen batch, I will try 375F starting at 9 minutes for that golden brown color). I also didn’t refrigerate overnight and my cookies had risen to about 2 3/4″ in diameter (I made 22 cookies using a 1 1/2″ cookie scoop)! Thank you! I just made these. They turned out really good. I used applesauce for most of the butter added 1 1/2 tablespoons of coconut oil. I did 1 tablespoon flax seed for the egg plus 3 tablespoons water to make the egg. I wanted to cook them right away so added 3 handfuls of oatmeal. They didn’t look thick enough before I added the oatmeal. I am low fat vegan and gluten free so these are such a treat. I absolutely love your pancake mix. I use the flax seed egg and applesauce for the fat. They turn out perfect every time. Thank you so much for sharing your recipes. This came out absolutely disgusting. Did not hold together at all. Waste of time money and supplies. Thought I’d be making a nice snack for a friend that cannot have gluten, turned into a bonding moment, while hating this recipe. Ended up making simple peanut butter chocolate chip cookies. I followed every instruction to the letter. To me the they weren’t the best i have had. They turned out rounded and not flat and i will probably not make these again. I’ve got them chilling in the refrigerator! I subbed flax egg for chicken egg, as I’m making them to be acceptable for my vegan coworkers as well. Hopefully they turn out well despite this edit. Thanks for the recipe! I made these this morning. They turned out perfect! The only thing I did different was I used regular butter. Oooey gooey perfection!!! Well I have renamed this “Chocolate Chip Cookie Bark”. After three batches – these are totally flatter than a pancake and extremely sweet and the color is very dark. Could it be the baking mix and should these be baked with gluten free flour in lieu of the gluten free baking mix? I used gluten free baking mix and I took them out when they we’re still a little soft in the middle. They were perfect! I did use regular butter though, not vegan. Might I add that the giant cookie of 24 balls did not cook so well. So I highly recommend baking them in sets of 12 or 6 for the best texture results. Also make sure the baking tray is cool and the balls are replaced in the fridge to be as cool as possible when entering the oven, this ensures perfectly shaped cookies which are not too flat and pancake looking. I actually put my batter into the fridge, then rolled them into balls and replaced them to get nice an firm again because my warm hands melted them a bit. This recipe is crap. My cookies didn’t rise AT ALL. You need baking soda or baking powder. Two thumbs DOWN ???? I LOVE THESE COOKIES!!! I followed the recipe for the GF Pancake Baking Mix EXACTLY and then made the cookies using this recipe. My cookies came out flat, but OH SO DELICIOUS! We can’t stop eating them! I went over the comments and saw that some had the same problem and some also said that you had a note once to add baking powder, baking soda, and salt to the cookie recipe. Maybe that’s what went wrong? If so, please let me know how much of what I should add to the recipe since I have about 6 people coming in less than two weeks for ten days. 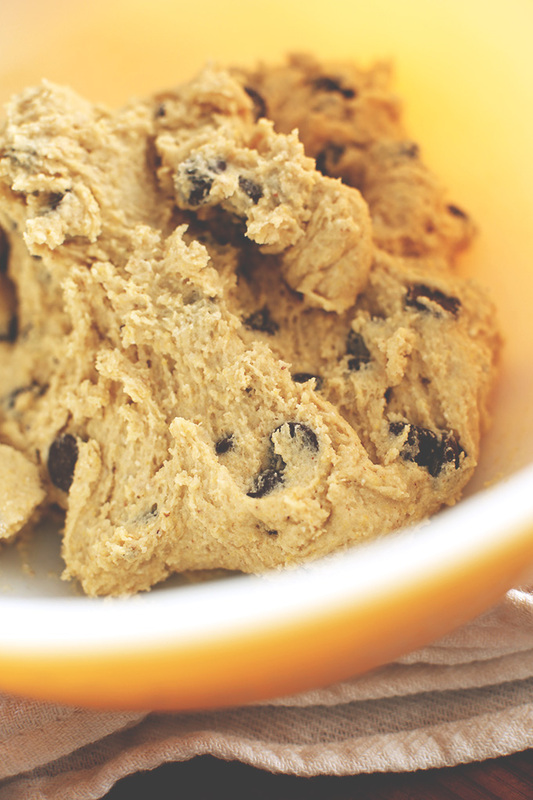 Having a premade cookie dough in the fridge would sure make life easier!! The results were rounded cookies that were a little dense and dry, but still edible and good, especially right out of the oven (cooled slightly). I also experimented with another batch using cocoa powder and coconut oil and white chocolate chips and will post the results soon. 1/4 teaspoon each of baking powder, baking soda, and salt and omit the xanthan gum entirely, since there is enough in the original mix. I hope this helps! to make this recipe completely vegan is there anyway to use an egg substitute and get the same results? I haven’t tried it that way, but if you do, let me know! Seriously, these are the best! They don’t taste GF at all. What kind of sorcery is this?! I’ve made it with different baking mix brands, and they’ve all been successful. Bless you, bless you! These are AMAZING! Soft & chewy…would never think that they are gluten free! Thank you for the amazing recipe. We wanted to eat them all up, but are saving them in the freezer for when family is in town next week. They don’t know what they’re in for! ;) Again, thank you! I’ve made these three times before and absolutely loved them! I don’t have a decent cooking/baking bone in my body so I was a bit disappointed to return to this recipe to see that you’ve removed the gluten free mix at the bottom with the ** next to it :-( I don’t remember what it was and what to use now as the pancake mix recipe is too confusing. Please bring it back or can anyone let me know what it was please? Thanks! This recipe came out well with modifications. The recipe doesn’t list baking soda, baking powder or salt so I had to add that in. The dough was too wet so I added another half cup of flour to firm it up more. Without these two the recipe would’ve been flat mess. Why has the measurements for a baking soda and powder been taken out? This recipe has been my families favorite can you please add the note again? Hi Sarah, the measurements for these ingredients can be found in our recipe for our GF Baking Mix! Hi I just found this recipe and made one change which I think makes them extremely delicious and not too flat. I put in 1/2 cup milk chocolate chips, 1/2 cup bittersweet chocolate chips and 1/2 cup white chocolate chips. More chips makes them more delicious in my families opinion from the biggest to the smallest one of us. Good taste but very crumbly! I left them in for 12 minutes to get the browned edges as described in the recipe. I think it may have been user error. I have another batch cooling right now after taking them out at 10 minutes. This recipe is a regular repeat for me! Thank you Dana. ? Substituting coconut oil for butter and your cookies are too crumbly and delicate? Add a tablespoon or two of nut milk or seed milk and it will almost always fix this problem. ? Yum!! I used 1 1/2 cups of gf baking mix, baked in a 9×9 pan for 35 minutes. A little crumbley, but great tasting. OMG! 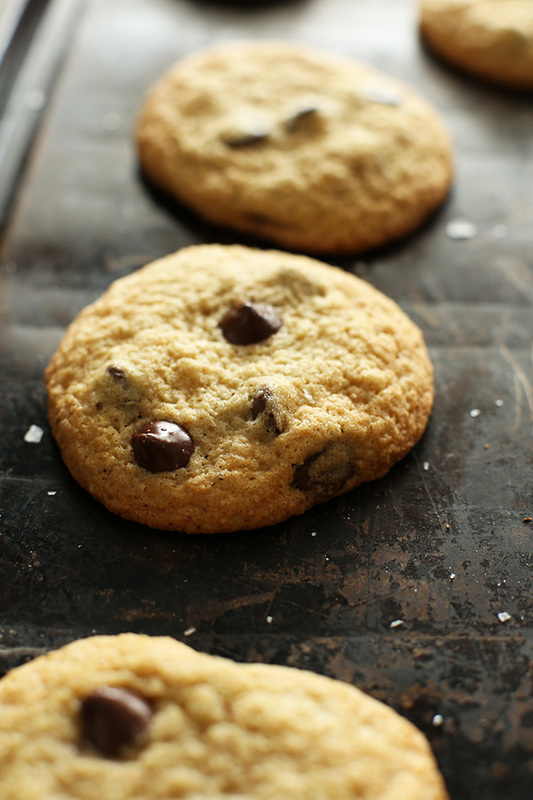 These are the best Chocolate chip cookies I’ve ever had, Gluten free or not! I made the dough last night, let them sit in the fridge, and made the cookies today! YUM! I only had one, but could’ve eaten the whole batch! The 1st batch, I roll them and flatten them a little, also cooked them to only 10 min. Those came out a little raw looking in the middle and a little too flat, But the second batch I just scooped out without rolling or smooshing them down and I baked them in my oven for 12 min. They came out excellent! Nice golden brown and crunchy on the outside and softer in the middle. Thank you for the recipe, it’s a keeper. By the way my hubby doesn’t need to eat gluten free, but he had 6 cookies today! LOL. I will link you on my blog, if I share the cookies. Forgot to say, I used gluten free CAFE All purpose Baking Mix, that I picked up at Walmart. I didn’t see salt on the list, but added 1/2 tsp of Sea Salt and added 1 tsp of baking soda too. Can I use non hydrogenated organic red palm and coconut oil shortening instead of vegan butter? If so, would I use equal amount as the recipe calls? Thanks for your input! YASSSSSSSSS GURL!!! DEEZ COOKIEZ BE SWAGALICIOUS!!!!! I have to say this is an awesome recipe. I used Bob Red Mill all purpose gluten free flour and added 3/4tsp xantham gum. I ran out of vanilla extract this morning for my cinnamon raisin oatmeal so instead, I used 1tsp of pure maple syrup. I had to bake them for 15 minutes at 350 and did not refrigerate them overnight. Wow!!!! These cookies are amazing! I am an aspiring baker with 2 gluten free siblings, so I naturally had to make these. They came out just like it advertised! I altered some things, like I used buckwheat flour instead of the all purpose. They still came out amazing! I surprised myself with how great the buckwheat tasted with the chocolate chip cookie dough. All in all, an amazing recipe that I will recommend to anyone! I don’t have gluten free mix at hand, what can I substitute in this recipe? Could i use oats? I’m baking these for my Kindergartners V-day gift! Buckwheat would work really well. I tried it! Hi I was using your original recipe. with a different gf flour blend. (turned out great by the way) and i wanted to make it again and i can’t remember how much baking powder, baking soda, and salt i need to add. Is it 1/2 tsp? Thank you for sharing this recipe. I have made it 3 times so far ( never flat, always puffed and yummy cookies). I am not allegic to gluten, but love these cookies!! The key is dont forget the refrigation time and never overcooked it. :)..
What can replace the oat flour in the flour mix? A blend of all the other flours! this may have been kind of gratuitous…but i fancied these up with the following: about 3/4 cup crushed GF potato chips, a mix of chopped dark chocolate and chopped milk chocolate in lieu of the chocolate chips, and a little caramel center in each dough ball. added an extra egg to bind the potato chips in, sprinkled with a little extra GF flour to help structure the dough better, then froze for 30 min instead of refrigerating overnight. came out pretty epic :). thanks for the base recipe! Should somehow include the 4-6 hour chill in prep time to give late-nite cravers (like me) a warning. First ones were a little flat but delicious!! My EXTREMELY picky 12 year old with gluten and wheat allergies absolutely loved them. THANK YOU for sharing!!! I tried these with gf self raiding flour and they turned out great. Best recipe I’ve tried yet. ??? I just made these with a no name gluten free flour, added two tablespoons of tender flake no baking soda, powder or salt and used mini chocolate chips, chilled it for maybe an hour, I left a metal spoon in the middle to see when it would stand stiff, baked on the middle rack for 8-9 mins and they turned out perfect. My wife is gluten free and she said they were good. So I must have did something right! I want to try coconut oil next time. Can I freeze these like ,American refrigerator biscuits,whereby you roll the mixture into a cylinder shape, place in the freezer and slice of the amount of cookies that you require and place back in the freezer for next time. I love the idea of putting sea salt in there! 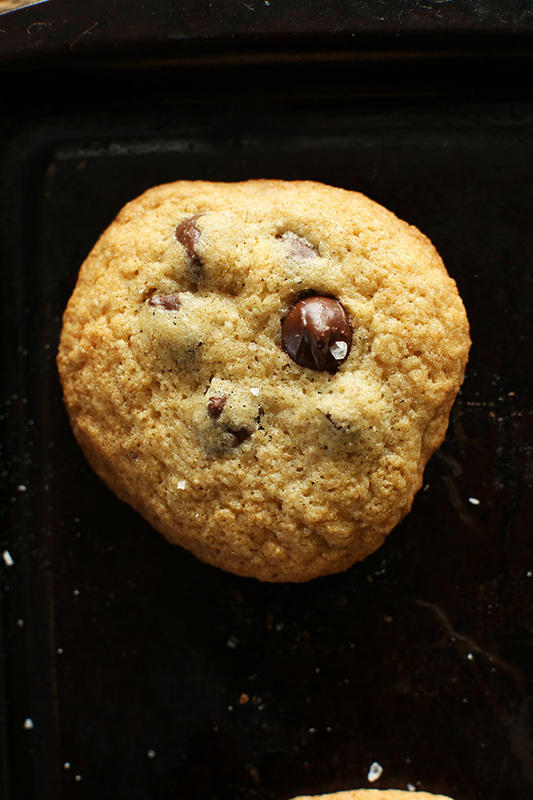 Sea salt and chocolate are my favorites together but I’ve never thought to combine them in cookies! thanks for the info but I tried this recipe accept the flour, I used flaxseed meal and almond meal. when I put it in the oven it spread and connected and looks like a brownie. do you know what I might of did wrong? Its because you just used flour, you need to use a GF baking mix different than flour. I used the bisquck gfree pancake mix/baking mix, and froze for 2o mins they came out awesome. These are just what I was looking for, the texture is wonderful!! I love the baking mix, looking forward to Saturday breakfast pancakes! I used 1/4 cup agave and 8pkts stevia powder instead of sugars. My boys can’t get enough, they’re devouring them….DELICIOUS!!! So it IS the pancake mix that should be used? I was confused and wanted to be sure it wasn’t just linking incorrectly. I used GF King Arthur Baking mix and completely skipped the refrigeration step. (only because I didn’t read the recipe through before preheating the oven and wanted instant gratification.) I just rotated the pan from top to bottom rack and baked closer to 12-14 minutes, left cool for 5 minutes in pan before putting on wire rack. My kids were so happy….usually have to settle for eating something mediocre to deal with the GF issue. But these were delicious…thank you for making 2 little kids beam. 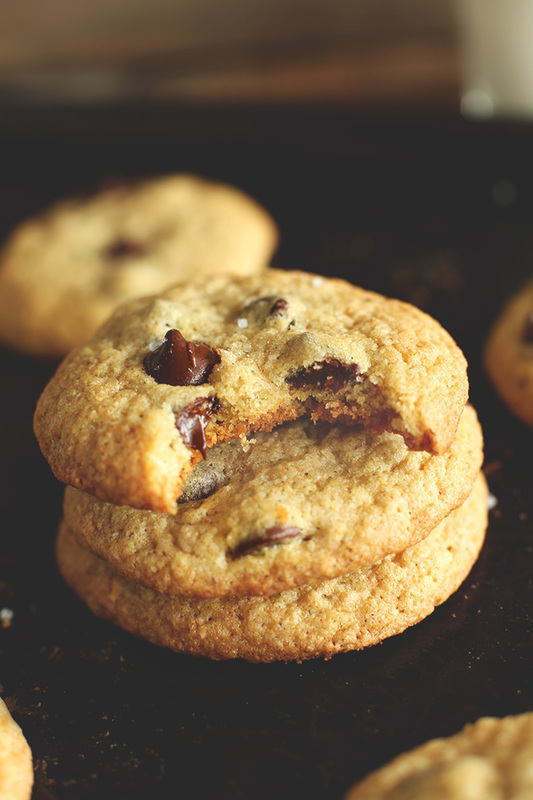 As for me, I usually can say no to sweets…but there is something about a melty chocolate chip cookie fresh from the oven. Worth the indulgence. These cookies are by far the best gluten free cookie recipe I’ve tried!!! I left the dough in the fridge for 24 hours before I cooked them and my cookies were perfect. I think if some people had issues with flat cookies they should let the dough sit longer and ensure they are using gluten free baking mix (and not just flour). I’ve made that mistake before. I agree completelym.the first time i made them, they spread throughout the whole pan. I didn’t see where it says to refrigerate! Whoops! No worries. I cut them in squares and used the for gf icecream sandwiches! Well, the second time i chilled them first overnight. Much better. I also used JUST tapioca flower..bobs red barn brand. And i did the 1/4 tsp baking powder as well. Thanks for all your recipes . Everyone i’ve tried has been a huge hit! These cookies came out awesome! I know I’m a little late in commenting but I just made these and they were absolutely lovely! They didn’t flatten or spread too much. I did leave out some of the chocolate chips as it looked like a lot – I won’t make that mistake again! I will say that they browned a little too much on the bottom so I might take them out earlier (I had them in for 12 minutes as they had no colour at all at 10). I used Bob’s Red Mill all purpose baking flour, which I’ve had a lot of success with. Made these and they spread over the pan. I think the butter to mix ratio is incorrect. The batter tasted great but I would add another 1/2 cup mix. I made this batch twice and both times they turned out completely flat! I used a pre-made GF baking mix and then added the 1/2 tsp of both baking powder & baking soda. I read this happened to other people as well. Any solutions?? dont know whats wrong as i followed instructions to the latter? Having made these cookies numerous times now, I feel I need to leave a review. These cookies are DELICIOUS. You could never tell they were gluten free. I use Bobs red mill 1:1 flour . They’re soft and airy and sooooo flavorful. Most recently I’ve substituted the butter for coconut oil . I didn’t think these cookies could get any better but the coconut oil compliments this recipe so well. I love all your recipes, thank you for sharing them! Thank you for posting this recipe for novice gluten free cooks like myself. Another perfect recipe. I substituted the egg for flax-egg and a drop of almond milk. They are perfect. Just for the heck of it Iexperimented with this and made the following changes that worked out great: Flour Pamelas —Pancake/baking mix 2 1/4 cups–pinch of baking soda–8-10min at 350..
trick don’t over work the batter ….chill for 30min or longer. also made them with just walnuts and almond extract.. GOOD STUFF.. I only use honey or maple sirup, but will it change the texture or it will be ok? I haven’t tried that, but yes, it will likely change the texture. These were delicious. I made them for my kids and didn’t read the bit about chilling the dough and since kids can’t really wait lol we just put blobs on the tray and they still cooked wonderfully. I love This recipe! I just found out that I have celiac disease as well as an egg and milk allergy. I was feeling kind of depressed about not being able to eat what I want, when I found this recipe. I made the cookies last night and they are so scrumptious. I use an egg replacer and the cookies still turned out great. I also skipped the refrigerating step, and used coconut oil instead of butter. My friend who doesn’t have allergies asked for seconds, and my son loves them. Thanks so much! Do you think this recipe work with normal gluten free pancake mix? We have the Live G Free Brand. It should work, but I’m not familiar with that brand. Let me know how it goes if you give it a try! I just tried these yesterday and they turned out flat, gritty and greasy. I followed the recipe very carefully, so will not be trying this again as the GF ingredients are too expensive to waste. Aside from all the issues with texture, the cookies were also gray due to the buckwheat flour. I’m just curious if you use a specific brand of buckwheat flour that’s not gray. Can you use Earth Balance instead of the butter to make them both gluten free and vegan? I added a couple of tablespoons of roasted and crushed hazelnuts to the mix as I’m a sucker for chocolate/hazelnut and yuuuuum.. I did find either due to the extra oil from the nuts or the flour I use (White Wings gluten free) that the mix was a little too soft when baked, spreading out to be very thin. After gently beating in 1/3 cup of plain GF flour to the double batch it was perfect. Mine were amazing! Best recipe I have ever tried! Also, just wanted to know if you can freeze them? And if so, how long do you have to freeze them? Yay! Thanks for sharing, Hannah! I’d think they freeze well for up to a few weeks! For some reason mine stayed into balls and didn’t melt down I have no idea what I did wrong ? These cookies turned out delicious!! Thank you for sharing. I rolled them into balls but they didn’t flatten like a cookie. They remained the shape of a ball.. How can I get them to form a cookie shape?? Hi! I am new to all this, so please bear with me. I am dying to make this recipe. However, when i looked at your gf flour, i noticed it called for corn meal. I am unable to eat corn so I am wondering if there is a substitution you could suggest? Thank you for your help! Love your site! I would suggest subbing a mix of two other ingredients you CAN have, such as buckwheat or white rice! Perfect! That is what i thought but wanted to make sure it wouldn’t ruin the recipe! :) Thanks! On the page with the gluten free flour mix/recipe it doesn’t tell us how much of each powder of flour to put in so, could you please put in the measurements? I’ve been searching for a great g-free choc chip cookie recipe & have tried so many…this is my favorite!!! I just made a huge batch and put them in the freezer in a tupperware…I take a few out & pop them in the microwave for 20 seconds…perfect. Can i use gluten free pancake mix to make this cookie? Yay! Thanks for sharing, Lorraine! These are SOOOOOO goood !!!!!! thank you so much! Thanks for this recipe. As I cannot find brown rice flour where I live in Switzerland, can I substitute it with white rice flour? why are you soo mean maybe there not good bcz they are GLUTEN FREE!!! I’m making these now and they’ve been in the oven 14 minutes, have not melted down or browned. What’s going on? My oven just baked a batch of muffins so I know it’s not a problem with the appliance. We did not chill it maybe that is why it turned into one large rectangular cookie. Nevertheless it was the best chocolate chip cookie I ever had. haha, yeah, chilling will help with that. Glad you still enjoyed it!! Just made these, and they came out perfectly. I followed your directions, no additions or substitutions. This worked well with king Arthurs GF baking mix. As of 10 days ago, I had a regular diet filled with gluten. These taste NO different than a conventional cookie. Thank you, thank you! Thank you for this yummy recipe! Subbed raw honey for the sugar and they were STILL scrumptious :-) Looking forward to trying more of your recipes. I am trying these, adding a little honey and almond butter :) I’m hoping the honey gives them that carmelized, chewy texture. I used oat flour and added a bit of xantham gum. Fingers crossed. This recipe was spot on! I ran out of sodium bicarbonate and doubled the baking powder instead and it still turned out fab! For someone who is seriously gluten intolerant such as myself, this recipe is gold! Hoping that you’d keep posting more GF desserts! I see these comments are several years old but I just found and made this recipe and had to leave a comment. These cookies are ridiculously good! I never would have believed it from a gluten free cookie. I just ate them fresh out of the oven and they are every bit as good as a “real” chocolate chip cookie. I don’t know how they’ll do in a few days but they probably won’t last that long. Finally I can make cookies that EVERYONE will be able to eat and love. (no more torture of making cookies for the gluten eaters and not being able to even taste the dough!) I followed the recipe exactly and used Arrowhead Mills baking mix. I did end up cooking it longer, probably 15 or 16 minutes. Perfection…I can’t thank you enough! Made them! So delicious, but after cooking they got a hard? Is it because I put them into a mini cupcake pan? Wanted to make cookie balls lol .. Still very tasty, next time I will leave them on a baking sheet. Thoughts? I substituted the baking mix for White Wings Gluten free plain flour blend and added about an extra tablespoon or two than the recipe because the dough was too wet (not sure if this brand is sold in other countries, I’m Australian). I also forgot the baking powder and soda, but I didn’t realise until it was too late. I refrigerated the dough for four hours then baked the cookies and they turned out great. Best GF cookie I have ever had. I’m concerned with these spreading out and becoming flat while baking. This happens every time I use butter. Should I use something else or try butter with these? Can you substitute a dairy free butter for the regular butter? If so is it 1:1 ration? Can’t have dairy or gluten but would love to try this recipe! Yes! same ratio. Good luck! Just made these, and if you follow the directions to a T, they make a great tasting, pretty cookie. I was looking for a recipe to try out xylitol, so I subbed it 1:1 for the granulated sugar, and used coconut sugar for the brown. I jumped in and started making them before I realized they needed to be chilled, so I left the dough in the fridge over night and in the morning rolled them into tight balls on the tray. I noticed they were flatter if I didn’t roll the ball as tightly, but were still never “flat”. The cold, tight ball into a hot oven is the key. Lovely recipe, thanks! In case anybody is interested, I just made these using the Dove’s Farm self-raising gluten free blend. I doubled the vanilla, added a pinch of salt, and did not refrigerate. Dropped onto the tray in large tablespoons. I put it at 180C and left it for 9 minutes for one batch and 11 for the other. Using this method, these cookies do not spread very much. They are mostly puffy but may sink as they cool. The longer batch is overall more golden but all in all they came out well! I had the same issue, so in the end because I had a bit of left over dough, I flattened the dough before putting in the oven and now it looks a little more like biscuits. I want to try this recipe, but I’m wondering if adding pudding mix to it would help or ruin it? What do you think? I normally make all my gluten full cookies with pudding mix..
Not sure on this one. But report back if you give it a try! Why don’t you put the salt and baking soda into the recipe….I wasted a whole batch. Best chocolate chip cookie I’ve ever eaten. I have to do gluten free desserts and am just now learning to cook so I’m glad you included the substitution of measurements for baking soda and baking powder, seeing as I have an interesting flour mix to begin with…Thank You!!!! Anything i can replace the gluten free mix with ? Cannot find those ingredients in my small town, only have whole wheat and i guess oat flour which i can make in my nutri bullet. help! these look delicious ! I would recommend Pamela’s baking mix if you can get your hands on it! Just made these Soooo good. If I’m using your gf baking mix, I put 1/4 cup of granulated sugar in both the baking mix and the cookie mix, right? Any ideas on how to make these a double chocolate chip cookie instead? The taste of these cookies is excellent- can’t tell the difference from the non-gluten free cookies! I had pre-made Bob’s Redmill GF flour on hand, so added the extra salt, baking powder and baking soda like advised. In my haste, I didn’t see that they were supposed to be chilled so they spread across the baking sheet and I had to peel them off. My only suggestion would be to indicate at the top of the recipe that they need to be chilled for a long period of time so busy mommas trying to make dessert for the kiddos know right off the bat that they won’t be ready right away:-). I will be making these again though! So glad you enjoyed them, Sarah! Thanks for the note about chilling and thank you for sharing! First off, the flavor of these cookies is awesome. I’m slowely but surely perfecting my chocolate chip cookie recipe, and aside from the discernable bits of cornmeal, they taste like my regular gluten invested cookies. While i’m not gluten intolerant, several of my friends are gluten intolerant, so i thought i’d give it a try baking some cookies for them. Like i said, flavor is awesome… But i’ve tried several batches and i just can’t get the centre of the cookie to cook. I even tried turning my oven down to 300, and leaving them in for 20 mins! And i still can’t get them to stay fluffy. Like i said, i’m new to gluten free baking, so i’m sure it’s me, not the recipe. Any ideas on how to cook these evenly throughout the cookie? Or any other tips, i’m open to any suggestions. I made these yesterday and am so pleased!! I used coconut palm sugar instead of granulated, Bobs Red Mill GF flour with BS and BP as listed at the bottom of the recipe and added about a cup of dried cranberries. Once all mixed, I rolled dough into logs in parchment paper and set in freezer for about 3 hours. Once hardened well, sliced into about 3/4″ thick discs and baked for about 10 minutes. Had no trouble with flattening at all. At first thought they were going to be a little crumbly as is usual with GF but after they sat for a bit they were perfect!! Great idea! Gonna try that in my next batch. Hi there your GF pancake mix requires 1/4 cup granulated sugar and then this recipe requires 1/4 cup granulated sugar + 1/2 cup light brown sugar. Or do you make the gluten free mix without sugar and then just use the 3/4 cup sugar in this recipe? I was wondering if you can add vanilla pudding mix to make the cookies more softer. Also, what can I substitute the oat flour with? I haven’t had a good chocolate chip cookie in 6 years. This recipe is outstanding! I may have a tummy ache later from eating too many! These cookies look delicious! I wanted to make these cookies to send overseas in a gift package. Will these cookies travel well? I was going to individually wrap each cookie and then seal it in an air tight comatinee before sending. Thanks. This is probably a dumb question, but do you use a greased or ungreased cookie sheet? I didn’t read it in any of the comments, and the directions don’t specify. Normally, it’s ungreased, but I don’t want to assume. I too made the mix and didn’t notice the refrigerating part. So I guess my daughter will have to wait until tomorrow. :( I substituted millet flour for buckwheat since I didn’t have any. The batter I sampled was yummy. Thanks! YUM! I’m a vegan so I used earth balance vegan butter and substituted the egg with a flax egg (1 tablespoon ground flax + 3 tablespoons water, whisked and set aside for 5 minutes). Anyway, these cookies are PERFECTION! Thanks for sharing your vegan revisions; I can’t wait to try this! can it possible if it is possible then please suggest me name biscuits in the market. I will take responsibility for not reading the full instructions before starting this, however I want to note that the prep time of 30 minutes and total time of 40 minutes does NOT include refrigerating it for at least 4 hours before rolling into balls and baking. That said, so far the cookie dough tastes great and I’m sure they will come out really good. I made these yesterday but used half oat and half rice flour as well as coconut nut and regular butter. I subbed coconut sugar for the white and used unsweetened chocolate. I put it all in the food processor to mix and then cooked on a pizza stone. They only lasted a few hours and that’s because we left the house. I just made them and they are delicious! I used Vegetable Oil instead of butter; semi-sweet chocolate mini chips (by Enjoy Life)- dairy, nut & soy free (3/4 cup); and used White Rice Flour w the baking soda, baking powder & salt add in. Chilled it overnight, as recommend, and they are delicious! I was scared they would taste oily, but not at all. I made two batches so we can have one for home and one to bring to my Son’s school. FYI- I usually bake from a box, unless it’s a family recipe. This will be my new go-to cookie for our household. Thanks for the recipe! great recipe. I had never cooked gluten free before and the hardest part was figuring out when the cookies were done. They are done but chewy just when they sightly change color on the edges in my over. When I pulled them they didn’t seem done till they cooled and were just perfect. I was also cooking high altitude. I had to use 1/4th less butter and sugar, and non packed brown sugar so they wouldn’t run. I was looking for something to make with my failed chocolate frosting. (It turned out more like chocolate moose.) I found these, and I substituted the flour with all purpose gluten free flour. They definitely were chewy and moist, which I was looking for, but tasted like a big bite of cooked flour. The chocolate chunks I put in it were okay too. But it went great with the chocolate moose. I ended up cutting out the centers, and putting a good amount there. Almost like chocolate drop cookies. They’re very good that way. Otherwise I wasn’t overly excited about them. I tried these but baked in a 8×8 glass dish and added chocolate chips and coconut to cover and baked 5 more minutes. In all i baked them 25 minutes at 350. To yummy to describe. Hi – quick question! Would different flours affect it? I used white rice, tapioca, potato starch, oat flour and cornmeal. When baked, they spread very thin. Have you ever experienced this? Loved them. Used Bob’s red mill Gf flour and they came out great! Great recipe! Thanks for sharing, I’m currently waiting on my first batch to cool and they look positively delicious! These have brightened up a bad week. Remind me of what non-GF cookies tasted like. Thank you! I used GF self raising with added Xantham- brilliant. I made your chocolate chip cookies two weeks ago and they were fabulous. See my comments on June 16th. I am about to make another batch today but the link to the baking mix has been changed to the pancake mix. Help! I didn’t write down the old baking mix and I don’t have the pancake mix ingredients. Can you please post the original GF baking mix? Thanks very much! My husband is gf, so I’m always looking for good recipes. These are fantastic. I exchanged the butter for some coconut oil, and they turned out picture perfect and delicious. A little kosher salt on top doesn’t hurt either. Thanks for sharing, Valentina! Glad you both enjoyed them!! Not a fan of gluten free but my son had to bring gluten free cookies to school for project. Good cookies being that they are GF. Mine did not turn out flat and cooked really well. I refrigerated the mix for only one hour prior to cooking and instead of rolling the dough into balls I gently spooned out onto tray. Thanks for the comments, helps with cooking your own. Forgot to mention that I used brown rice flour with bpowder, bsoda and a pinch of salt. Regarding the flat cookies…could it be because your bp or bs is old? Hi, I want to tell you, these cookies are AMAZING!!!! I make two batches at a time cause they are so amazing, I do everything you say, even refrigerate, but they always come out flat. They are still good, but I don’t know how to get them to look like the ones in your pictures. I’m happy either way, but just thought I’d ask, seems like others are having the same issue. Thanks!! Perfect dough.. Then I cooked them and they seem to have melted and burned.. Any tips on how to adjust this so they hold up better? High elevation maybe? Hmm, did you chill the dough? For store bough gluten free mix, how much do we add aside from the extra 1/2 tsps. You mentioned in the footnote? Thanks! Which egg replacer would you recommend to make vegan!? I pre-heated my oven and finished mixing in the chips when I read “refrigerate for 6-8 hours.” =/ Why did I pre-heat my oven then? Lol! Small criticism but I cannot wait to try these in a few hours. Thank you for the recipe and I’ll let you know how they turn out. dough at 6 pm was that the listed 40 min. prep time did not include an overnight in the fridge. Hi! I tried to make these yesterday and again today. Both times they burned on the bottom and we’re not completely cooked through. I followed the directions to a t and even messed with the placement of them in the oven to see if that would help. I have made your other recipes without any problems so I’m not sure what’s going on! Any ideas? Hmm, I’m not sure Courtney! Sorry you’ve had an issue. Did you let them cool all the way before trying? Did you use my baking blend? Amazing…soft, chewy, full of flavour, and with a little crunch on the outside! I will try to reduce the sugar next time to see if they can be a bit less sweet…might try to adapt for an oatmeal cookie too? Unless Dana has plans to make my dreams come true by posting a recipe for that?? Thanks for the amazing recipes! My partner and I have 4 recipes marked to make over the coming week and I can’t wait! Ooooh, I like the idea of a GF Oatmeal cookie! Thanks for the request! Plus, they’re John’s favorite cookie so it’s kind of a given at this point ;D Cheers, Ashton! I did try the oatmeal gf cookie. Really delicious and the cookie held it’s form amazingly. I just added a 1/2 cup of gf quick cooking oats. It’s really hard to tell that they have oatmeal in them, you probably could add more. Love this site. Thanks so much! Sorry for the oatmeal lovers, but the majority of oats you find in the market in the US are not gluten free. Those diagnosed with coeliac disease should avoid oats. For those who are just experimenting with a gluten free diet, look for certified gluten free oats, but know that oats have a protein that’s quite similar to wheat’s gluten and may trigger similar reactions. I second this comment. These cookies look amazing and delicious! 4 gold stars for working toward GF goodness!!! What it does not address is that other grains (oats, spelt) have a VERY similar protein structure (thus their similar function in baking). Essentially they have their own gluten (oat = avenin and spelt = gluten). FDA allows this to be called gluten free, but a subsset of Celiac and gluten sensitive individuals will still have a reaction to oats and spelt. Knowledge is power! If you are celiac, research these grains before eating them. I’m going to go make some cookies (though I’m going to put in coconut & almond flour instead of oat). Thanks again for the excellent post and beautiful pictures. Great to hear! Thanks, Kate. And I’ll be sure to add the sea salt note to the recipe. Thanks! These cookies looked so good I had to try them! Well I made them using your GF baking mix and they turned out flat as a pancake. So sad! Any suggestions on what I did wrong?? That’s so odd! Did you remember to add the baking soda/powder? That’s the only thing I can think of. They aren’t a super fluffy cookie but shouldn’t be super flat either. Hope that helps! The same thing happened when I tried to make them. I think perhaps I didn’t refrigerate them long enough…I’ll definitely try them again! I had the same problem…flattest cookies I’ve ever made, and I have made quite a few gluten free cookies, too. Oh well. I do wonder if it had to do with the refrigeration, since I skipped that part. But I never refrigerate chocolate chip cookies…just mix, scoop, drop and bake. Maybe I’ll try again sometime when I’m not in a hurry and have time to wait for them to sit overnight and see if that makes a difference. I do think that makes a difference. It helps them hold their form better before baking. I think it’s key for this recipe. Hope that helps! I didn’t realize I’d have to refrigerate the dough and I want these cookies tonite! Can I put the dough in the freezer instead? For like an hour? Hope so, cuz that’s where the dough currently is. I ended up freezing for 30 min. then taking them out, rolling into balls and putting into fridge for another 30 min, then baked them. They turned out perfect, not too flat! Weird question but can these be made with regular flour and not gluten free? Would the measurements all be the same? Thanks!!!!!! Yes! They can be. Just see the link to the original recipe for exact instructions. These cookies look absolutely perfect! I like my cookies to me crisp on the edges but slightly soft in the middle – and I love the addition of salt! 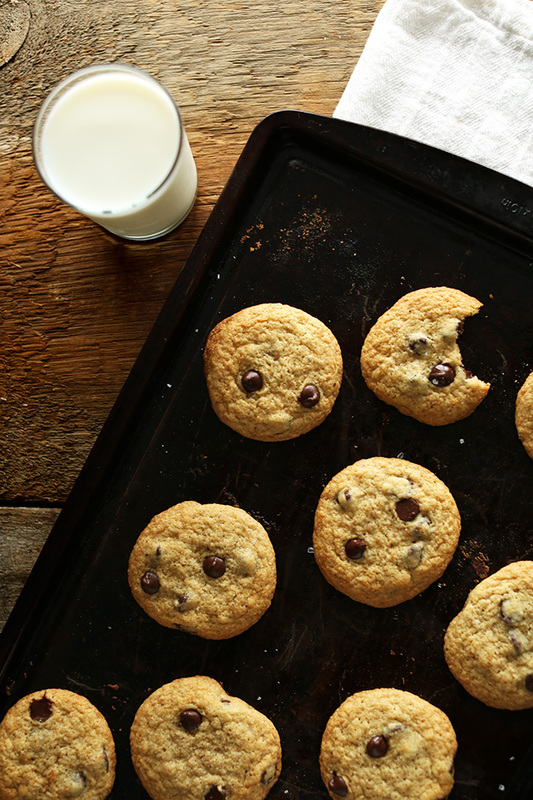 No chocolate chip cookie is complete without salt. Oh yes – those pictures are puuuurty! I can’t believe these came from that same mix – what else do you have up your sleeve with that stuff?! And those two perfect little chips on top of each cookie? Love. haha, thanks Jess! I have *one* more cookie recipe up my sleeve with this mix. So versatile! When you say baking mix, do you mean just Gluten Free flour or a boxed mix. Hi Charlie! We’re referring to our Gluten-Free Baking mix. You can find the recipe for that here! Holy moly!! Love these!! Cookies are the best! i’m loving all these gluten free recipes! it’s a goal to get more involved with them… and your blog is really helping me out! these cookies look amazing. I’ve been trying so hard to find a good gluten free cookie recipe – can’t wait to give this a try! Serves 24? More like serves 2 people 12 cookies! They look delicious! haha, so true. Thanks Lindsay! I can’t wait to try these. They look totally perfect! LOVE gluten free goodness! These look perfect. Is it possible to roll out the dough and cut out shapes from it? Try it, I found I needed to have a good ball, they crumbled when warm but once they were in the fridge for a while they were perfect my daughter loved them she hasn’t had a ccc for about 4 years and she said they were great I need more recipes using the glutton free pancake mix. <3 <3 <3 These look ridic! Thanks for all the gluten-free love lately.